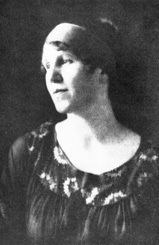 Julia Osipovna Ostrowska was born in Poland around 1890. She married Gurdjieff in 1912. She was 22 and he was 40. Gurdjieff said that she was an "'old soul' who had lived many lives." Little is known about her personal history, some saying she had been a countess, others a poor woman from the streets. Known for her dedication, poise and authority, she was his principal dancer in The Struggle of the Magicians. When the Institute at the Prieuré opened in 1922, she was known as Mme Ostrowska.1 She was in charge of the kitchens and housekeeping at the Institute, as well as continuing to dance the lead role of the Priestess in the Sacred Dances. In 1924, when Gurdjieff was seriously injured in a car accident, she and Gurdjieff's mother helped nurse him back to health. Soon afterwards she contracted terminal cancer. Mme Ostrowska died on June 26, 1926, and was buried in Avon, France, beneath the large dolmen that faces Gurdjieff's mother's grave. It happened that I sat on the very bench on which it had been my habit, during the first year of my writing, often to sit and work. At that time there frequently used to come and sit down by me on this bench, on each side of me, two near beings, the only ones close to my inner world. Usually when my mother left her home...and proceeded in my direction there would approach from the house called "Le Prieuré," my wife....to the bowed posture of the second I was quite unable to reconcile myself; each time when I noticed it there arose in me a feeling of revolt and my heart pounded like that of a balking horse. 1. James Moore, Gurdjieff: A Biography (Shaftesbury, Dorset: Element Books, 1999), 67–68. 2. Fritz Peters, Boyhood with Gurdjieff (Fairfax, CA: Arete Communications, 2006), 91. 3. G. I. Gurdjieff , Life Is Real Only Then, When 'I Am' (London: Penguin Books, 1991), 32–33.